The peppers added a really nice flavour. My husband (the family cook) likes to make a red pepper/tomato sauce for pasta. I have to watch my potassium intake due to a medication I take and red peppers are lower in potassium than tomatoes (a great source of potassium for most people). I've found I love the combination. I'm sure this soup is delicious. Alana from the UBC. Oh my, this does look delicious! My little boy surprised me the other day by LOVING a sample of this kind of soup at a grocery store. I'm sure that homemade would be much better, and this recipe looks delish! This is one of my favourite soups ever - and it's so low in calories! sounds delicious and what a glorious colour it is?! I'm looking forward to making this recipe and I'm always looking for simple, healthy recipes. Susan please do drop by and leave me some feed back as to how you enjoyed the soup. Tomato soup is the only type of soup that I will eat...although I have no desire to cook it myself. I always have my soup with a bagel! I like the sound of Roasted red pepper and tomato, shall have to give this a try! Erika I hope you enjoy it, do drop back some feed back if you make it. I love soups with red peppers in them and this looks so cheery and tasty! Karen I am on a soup marathon these days and this is is one of my favourites. A good friend is visiting tonight, so just in time! I really hope I still have the time to run out and get all the ingredients! I love the color of this soup. Looks really yummy and I'm hoping I'd do it right tonight. That's so good I hope you and your friend really enjoy this soup. Sylvia next time we arrange to meet we can have this for lunch. 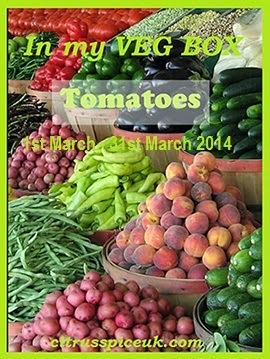 Ohhhh - this needs to be on my to do list esp when we have lots of tomatoes around. Bintu it so simple to make I am sure you will enjoy it. I've made this before. So nice. A beautiful colouir - such a shame I am allergic to red peppers!!!! That's too bad Ren, never mind I have some more delicious soups coming soon that you may enjoy soon. Not sure if my comment came through. I was just saying that the soup is a lovely colour, but it's a shame I'm allergic to red peppers! Ren the comment came through I have comment moderation on . The soup has a lovely smoky flavour, nice change from plain tomato soup. Mmm. This looks yummy. I'm always looking for new soup ideas, so thanks for sharing this. This looks lovely! Now to con my housemate into making it. I always find tomato soup so refreshing! Will be tried next time!! Sounds delicious. I'd want to stick some chili in there to spice it up! I have a recipe for this tasty soup that I made years ago. Will try your one, thanks for such a healthy and colourful one. I love the idea of adding a smoky flavour. Sounds delicious! I love soup and am always on the lookout for easy recipes to try. This sounds delicious! I will definitely give it a go! Have made red pepper and tomato soup before, but never with smoked paprika - sounds fantastic! 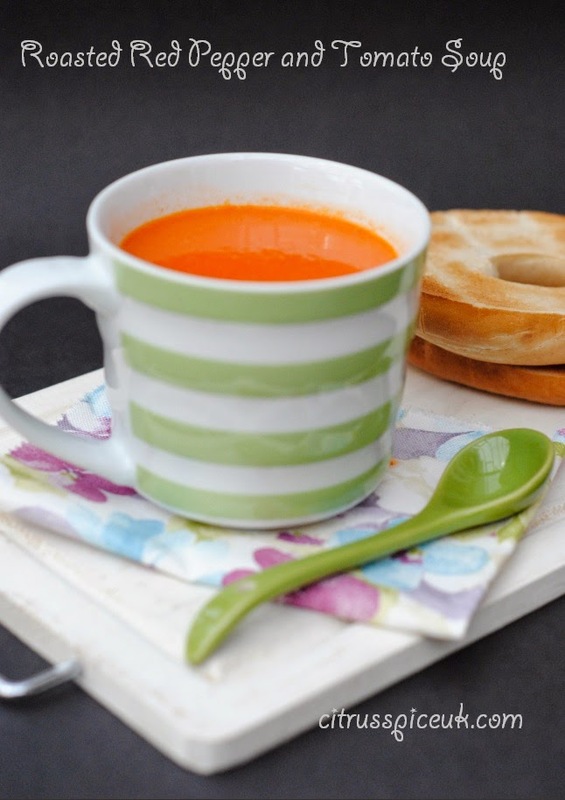 Red soup in green stripy mug looks fab! My husband is bit funny about tomato soup but I love it. what a pretty soup;) and as others have said very healthy! This looks like a really spicy and yummy soup. The colour of that soup is amazing Nayna and I love the mug too. This looks so easy to make and so healthy! Lovely combination for a tasty soup! And the perfect diet fodder too. Ooh, yummy, I love the mix of red pepper and tomato in general - living in the south of France for years does that to you! I'll have to try this out. Cream soup with bagel - dream food! This looks so full of flavour and not as difficult as I thought. Worth a try this week I think.